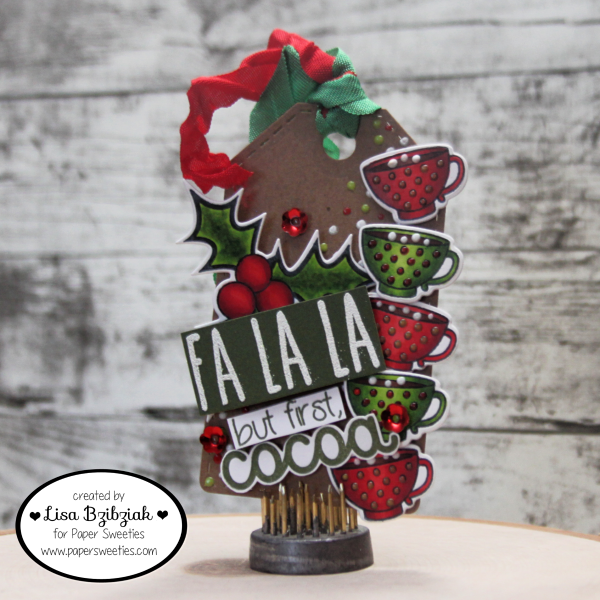 Life of a BZscrapper: 25 Days of Christmas Tags 2018 - Paper Sweeties! 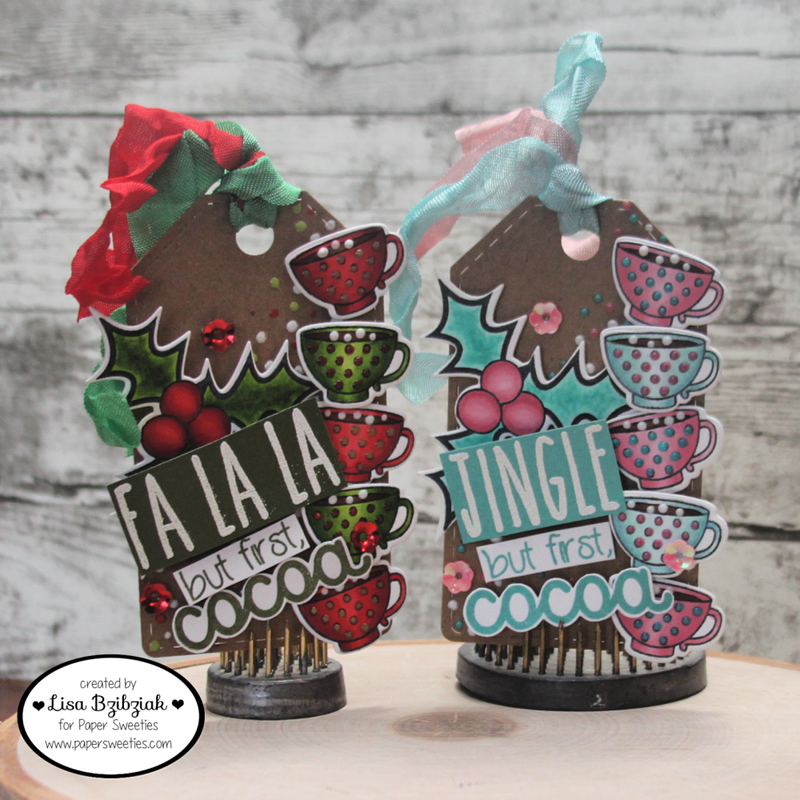 25 Days of Christmas Tags 2018 - Paper Sweeties! 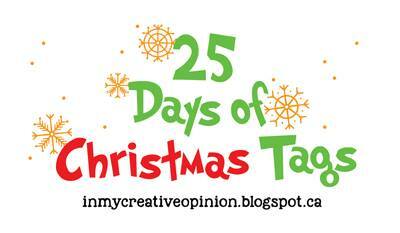 You may or may not be familiar with Tracey McNeely's 25 Days of Christmas Tags. 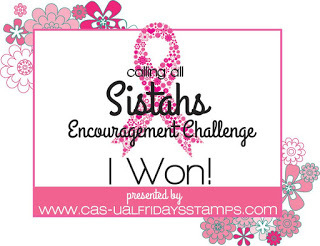 Each year in November, this event begins and there are tons of sponsors and prizes and lots of fun and inspiration! 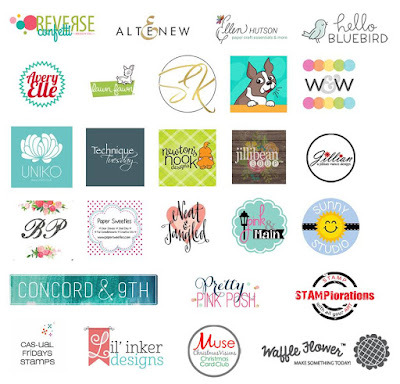 Each day a sponsor is featured on the blog and today it's Paper Sweeties turn! 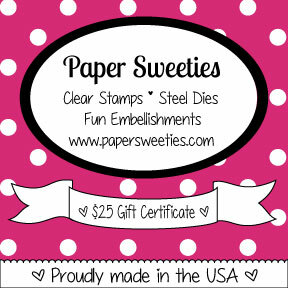 Paper Sweeties is a sponsor for this event and is offering up a $25 gift certificate to one lucky winner! There are lots of ways to gain chances to win prizes... you can comment at Tracey's blog and along the way when you hop and see what each of the sponsors' design teams have created for you and you can play along-create a tag inspired by one that you see along the way while you hop and link up! You can check out all of the ways to win and the rules at Tracey's In My Creative Opinion blog post here! 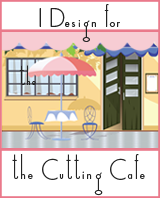 If you come here often you know that I love coffee, coffee cups, cocoa, even tea sometimes.. I make sun tea on a regular basis. I mean.. I live in Arizona so there is lots of energy for said beverage! 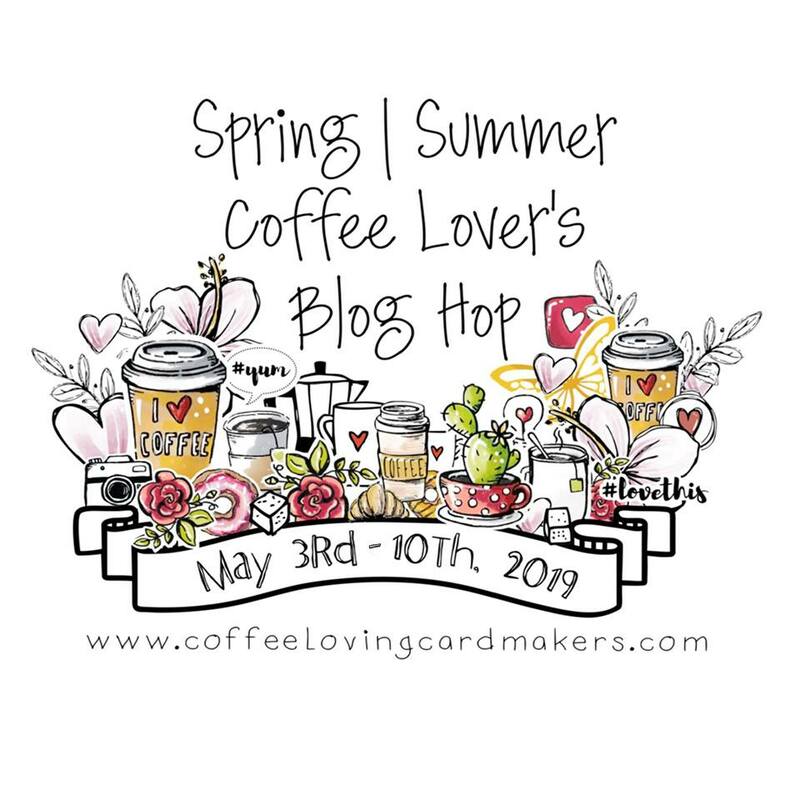 It will be no surprise to you the theme I used for my tags... although it may surprise you that it's not coffee...lol! I started with the tag from the For You Sweet Cuts. It's a great sized stitched tag, perfect on a card or by itself. 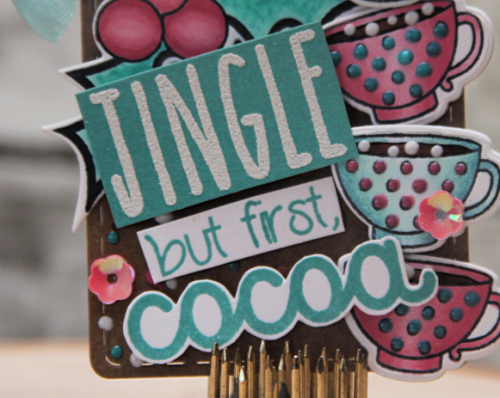 I added some Nuvo drops in red, green and white in a diagonal pattern across the tag. Then I stamped, die cut and colored the cups from the You Warm My Heart stamp set. I added some "marshmallows" to the cocoa with some white Nuvo drops and added the cups to the edge of the tag using varying thicknesses of popup tape. 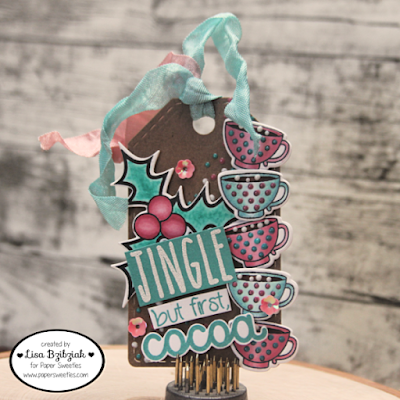 I stamped, colored and cut the holly from the Meet Me Under The Mistletoe set and then I built my sentiment... 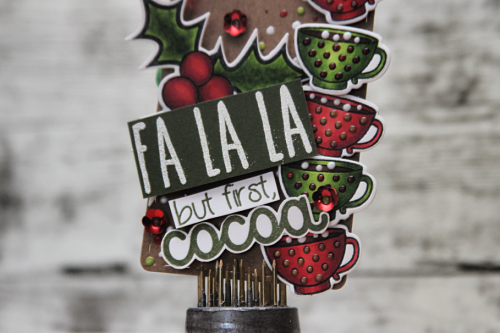 I stamped the Fa La La in Versamark and heat embossed it... that's a little sneaky peek for you... and then I stamped the "but first" from part of a sentiment from the But First, Coffee stamp set and the Cocoa is from the same set. I love it in these colors! Quite cool.. makes me feel like I might need some hot cocoa! And those cups... they're sweet in any color! I love my little marshmallows! Here's another peek at both! 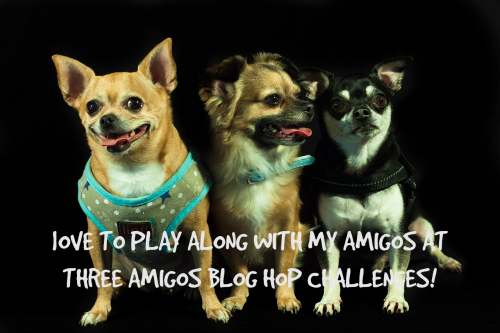 I'm playing along with the Outlawz Twisted Thursday challenge which is always Anything Goes with an optional twist! This week's twist is Hot Beverage! Hope I've inspired you! 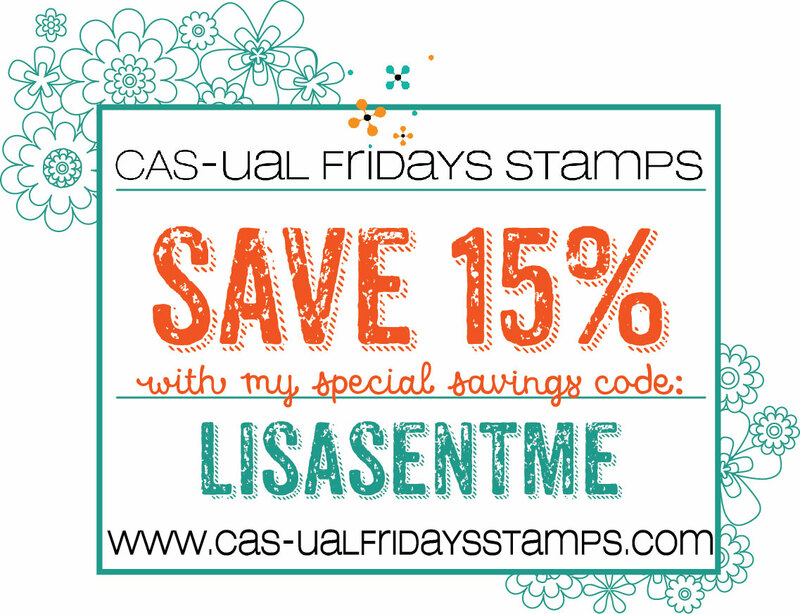 And maybe you can use something here to create and link up your own tag! Thanks so much for stopping by! 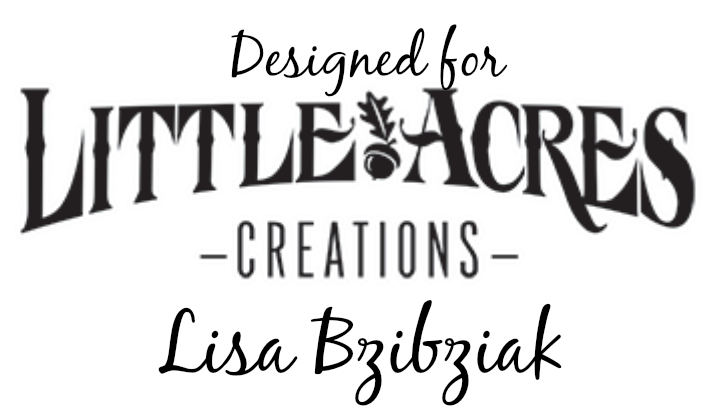 Be sure to check out what all of my teamies have created for your viewing pleasure today... there is a lot of awesome to be seen! And take a look at this! These are the sponsors! Pretty cool, huh?? Good luck! Love love love love love these! LOVING those stacked cups!!!!!! 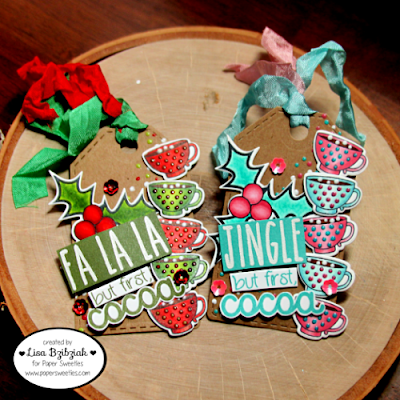 Fabulous tags - I love how fun and layered they are! The bases even look like they could be made of gingerbread in these layouts. I love the fun colours you chose too - looks like icing! 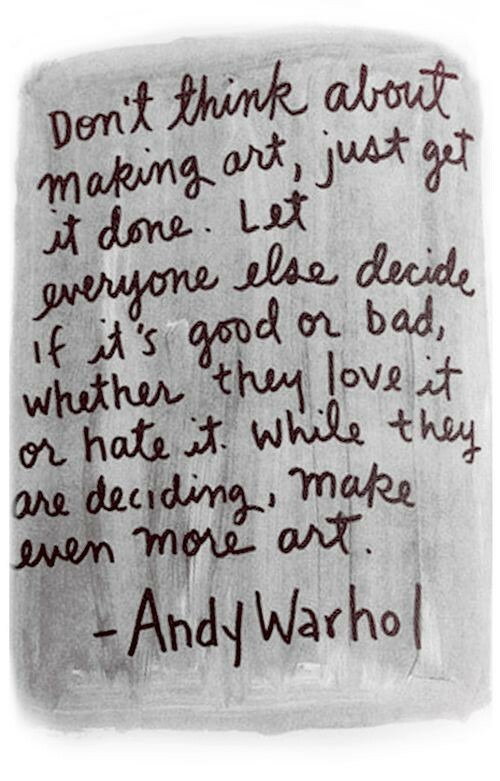 I look forward to the 25 days of tags because I am inspired to create--thank you! Awesome tags with the hot cocoa theme, Lisa!! Love the stacked cups and gorgeous colors! Love!! 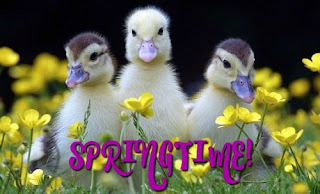 So fun and cute!!! Such sweet cards Lisa, these tea cups are simply beautiful. Well done! Ok... I'm madly in love with these tags. I had to pin them. I love the fun and whimsy of the tipsy stack of cups and your sentiments! And I even love the curly ribbon... Perfect! Are you kidding?!?! I LOVE THESE SOOO MUCH!! So many fun details and colors! Such cute tags and I love how loaded up with goodies each one is. These are fabulous! Such fun tags and pretty colors! 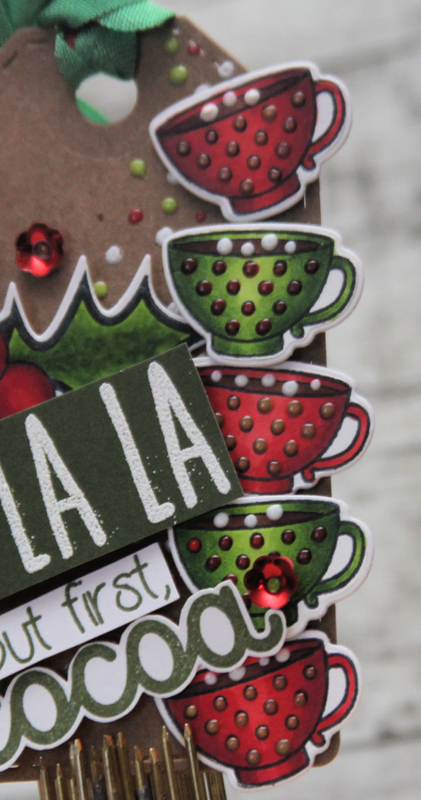 Love the stacked cups and the holly tucked behind the sentiments! Love those stacked cups and love the totally different color palettes! Great tags! LayersLayersLayers!!! I love them ALL! Both, traditional colors and non are amazing!! These are so festive, and I love seeing how different they look in the two color combos. so cute, lisa. i love your stacked cups. P.S. I have a cool crafty/antique giveaway on my blog. So sweet and adorable! I love the stacked cups of cocoa and the tiny marshmallows. Both variations are so cute but I think the pink and aqua tag is my favorite. OMGOSH!! I LOVE, LOVE, LOVE both tags! 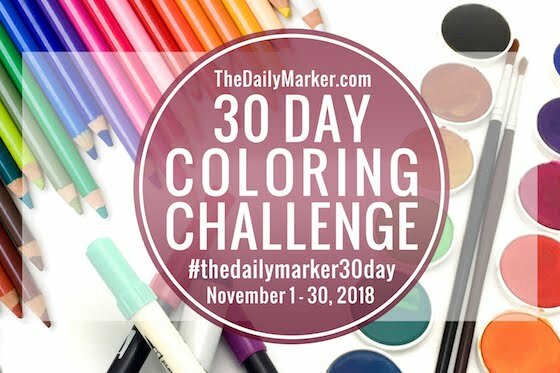 They are so fun and creative and wonderful color combos!!! ADORABLE TAGS! I think I actually prefer the blue and pink! So pretty! So sweet! They make me smile. Gorgeous and fun tags! Love all the fabulous layers and details - wow! These are some of the cutest on the hop!! The colors are awesome. The coloring is perfect!! The details and layers are very creative. They're perfect!! Wow, what a fabulous tag. Let Me Sing You The Song Of My People! You Are One Cool Chick! 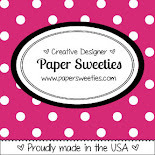 Caffeine Fueled Paper Play - Joy Clair!